Successfully Added 1.44 Inch Smart Watch - Bluetooth, Camera, Touch Screen, Pedometer, Phone Book Sync, Call ID, Phone Dialer to your Shopping Cart. 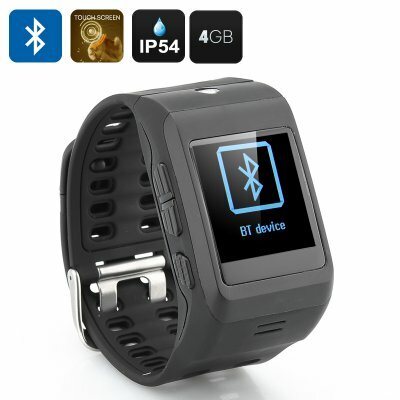 This 1.44 Inch TFT Display Bluetooth Smart Watch has a touch screen and 3 button interface as well as a camera for video and pictures, Phone Book, Call ID, dialler and SMS support with built in pedometer and 4GB of memory. This nifty Bluetooth smart watch is the ideal companion for anyone with an active life. It’s easy to sync the watch to your phone via Bluetooth and there is also an app which lets you sync your phone book messages and more, so your phone can be kept safely tucked away. With a discreet USB plug hidden in the robust wrist strap you don't even need any wires or cables, therefore making it ideal for the anyone on the go. Not only does this watch allow you to communicate with others via your phone but it also has a built in camera for selfies or videos and you can use it to take audio recordings in meetings or just as reminders. With 4GB of memory you can put music, videos or pictures on the phone easily via your computer so you can use it for storing important files or as a backup to some essential data on your phone. As well as being a great aid to accessing your phone it also has a build in pedometer so health nuts will love its ability to keep track of their daily foot count and estimates how many calories all that activity has burnt off and with its IP54 rating its capable of withstanding most dust and even some water so it can cope with the rigors of your daily routine. The 500mAh battery provides plenty of power so it can keep pace with your active lifestyle. Need .APK app for SMS support, only available for Android.